Finding the perfect fragrance can be tricky. Every woman wants a scent that smells feminine but strong and still makes heads turn, a scent that lasts all day without being overpowering. Fragrance Celebrity of The Year 2013 winner Taylor Swift has created Wonderstruck and Wonderstruck Enchanted, two perfumes that embody everything you want in your signature smell. Fruity and airy, Wonderstruck includes notes of apple blossom, raspberry and dewberry to give you a warm, harmonious glow and a definite confidence boost for your next date. The hints of green tea and freesia in this fragrance blend to make a luscious, fresh scent against your skin that will last long into the night. Wonderstruck Enchanted contains an irresistible blend of luscious wild berries and sugar-glazed petals, wrapped in a touch of sensuality for a captivating signature. It has an addictive balance of creamy flowers and sensual woods which blend harmoniously and add an alluring quality to the fragrance. Either of these fragrances could make the man you’ve had your eye on feel…well, wonderstruck! 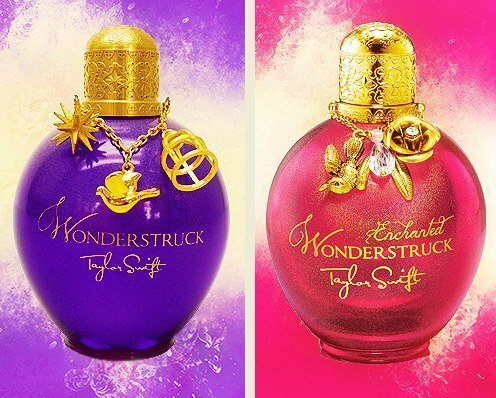 It’s not only their smells that make Wonderstruck and Wonderstruck Enchanted such special fragrances; both bottle designs live up to their names as well. Wonderstruck is held in a royal purple bottle with a majestic golden cap and embellished with a Moravian star, a dove in flight and a vacant birdcage. Similarly, Wonderstruck Enchanted‘s bold crimson bottle is bejeweled with a cluster of antiqued gold charms hand-selected by Swift, giving the bottle a vintage feel. When accepting this year’s fragrance award, the country songstress revealed that Wonderstruck was “all about a day dream, a fantasy, this romantic ideal that we all have.” We couldn’t agree more. If you seek the awe, admiration and delight that comes with being wonderstruck, then these scents are the ones for you! To add some enchantment to your life, two CupidsPulse.com visitors will have the opportunity to win Taylor Swift’s fragrances. We will be giving away one bottle of Taylor Swift’s Wonderstruck and one bottle of Wonderstruck Enchanted. You’ll want to grab this opportunity to charm your significant other on your next night out! GIVEAWAY ALERT: To enter for a chance to win Taylor Swift’s Wonderstruck or Wonderstruck Enchanted fragrance, go to our Facebook page and click “like.” Leave a comment under our giveaway post letting us know you want to enter the contest. We will contact the winners via Facebook when the contest is over, and they will have three days to respond back with their contact information. The deadline to enter is 5 p.m. EST on Monday, July 15th. Good luck! Congratulations to Kerry Clayton and Eleanor Cooper!